‘LOUDER THAN WAR’ REPORT ON PAUL’S SOLO ACOUSTIC TOUR. 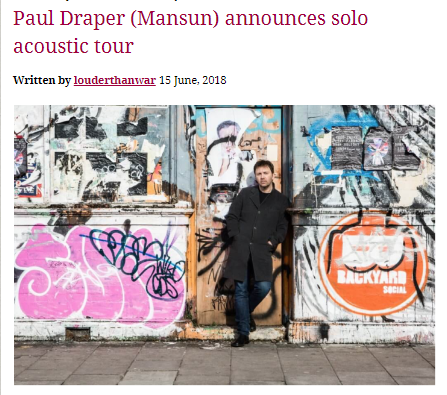 These shows will see Paul playing his first ever full-length acoustic concerts with regular guitarist Ben Sink, offering fans a chance to hear a set that spans early Mansun songs, tracks from Spooky Action and Paul’s solo EPs and as-yet-unreleased tracks from his work-in-progress second solo album. Tickets are on sale here from Wednesday 20th June. You can read the full Louder Than War article HERE .